The Queens Peak location, literally on the doorstep of Queenstown MRT Station and a stone’s throw from Orchard Road, is attractive. It sits on the fringe of the city, just 4 train stops from Tanjong Pagar & 5 stops from Raffles Place at the heart of the financial district. It is bounded by Commonwealth Avenue, Strathmore Avenue, and Dundee Road on 3 sides, and overlooks the Alexandra Canal Linear Park on the 4th side. On that side, the buildings, a church and school, are low-rise, providing opportunities for good North-South wind flows and pocket views of the greenery of Kay Siang Road Estate. 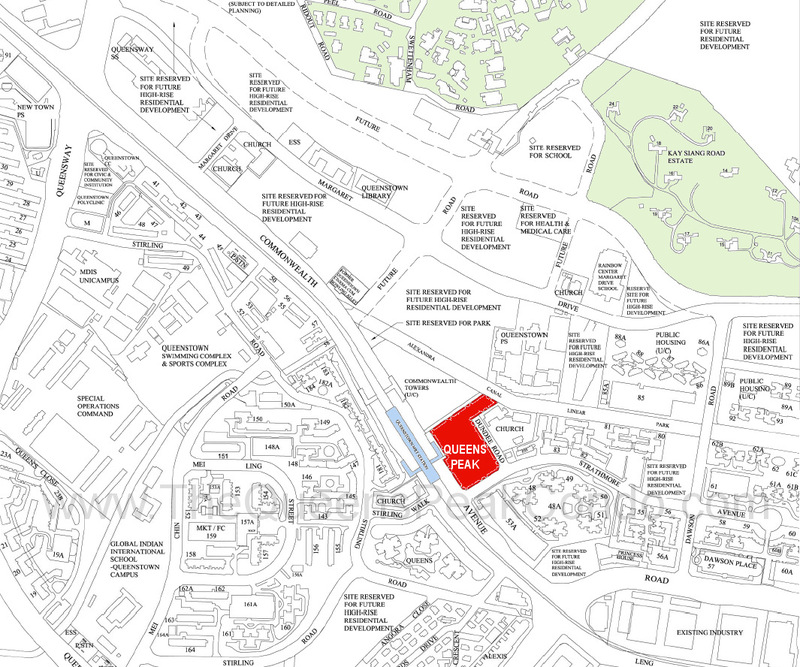 The Queens Peak location is a prime one, in the mature city-fringe residential estate of Queenstown, where even HDB flats are close to $1 million. Residents will have immediate access to the Queenstown MRT station via an overhead link bridge.
. 12 minutes drive to Orchard Road.
. 27 minutes by bus to Orchard Road. Please register here if you would like to be kept updated on the Queens Peak launch.